Sized to fit small spaces, the Riverby sink is an elegant and versatile addition to the kitchen as a primary, secondary, bar, or utility sink. A single-bowl provides ample space to soak and wash large items, while front and back beveled edges help keep water in the sink. A sloped base to a single offset drain minimizes water pooling. Crafted from enameled cast iron, this sink resists chipping, cracking, or burning for years of beauty and reliable performance. An included custom-fit sink rack also helps protect the sink surface from daily wear. Function and simplicity combined result in Ancona's Capri Series Undermount Single Bowl Kitchen Sink, the ideal addition to stylize any kitchen. Elongated and elegant, this undermount sink features an ample 29 inch bowl, perfect for all household cleaning tasks. 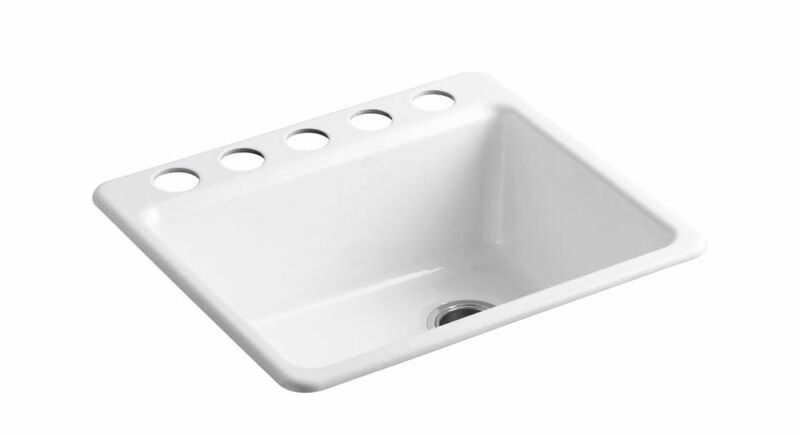 Accommodating to most counters and cabinets, the middle position drain allows better distribution and flow of sink. Fabricated in stainless steel, its satin finish and subtle curves blends into any kitchen arrangement, while adding a beautiful and reliable construction to your home. The 8 Degree bar sink offers sleek and functional style with thick, premium quality 16-gauge stainless steel construction for exceptional durability. Eight-degree angles on the front and back surfaces give you more space at the bottom of the bowl while reducing splashing. This handcrafted sink includes a custom-fit wineglass rack, which allows glasses to drip dry into the basin, and a bottom basin rack to help prevent scratches. The 8 Degree sink is handcrafted from thick, premium quality 16-gauge stainless steel for exceptional durability and universal style. Eight-degree angles on the front and back surfaces give you more space at the bottom of the bowl while reducing splashing. This sink includes a custom-fit wineglass rack, which allows glasses to drip dry into the basin, and a bottom sink rack to help prevent scratches. Riverby Undermount Cast Iron 25 inch 5-Hole Single Bowl Kitchen Sink In White Sized to fit small spaces, the Riverby sink is an elegant and versatile addition to the kitchen as a primary, secondary, bar, or utility sink. A single-bowl provides ample space to soak and wash large items, while front and back beveled edges help keep water in the sink. A sloped base to a single offset drain minimizes water pooling. Crafted from enameled cast iron, this sink resists chipping, cracking, or burning for years of beauty and reliable performance. An included custom-fit sink rack also helps protect the sink surface from daily wear. Riverby Undermount Cast Iron 25 inch 5-Hole Single Bowl Kitchen Sink In White is rated 5.0 out of 5 by 9. Rated 5 out of 5 by ppith from Very nice, modern, and functional. Single bowl undermount sink gives... Very nice, modern, and functional. Single bowl undermount sink gives us more countertop space and match out new light color quartz countertop very well, and our kitchen now looks more spacious. Rated 5 out of 5 by Gemma2121 from Beautiful sink!!!!!!... Beautiful sink!!!!!! Rated 5 out of 5 by Elmo from Beautiful sink. Exactly what I was looking for.... Beautiful sink. Exactly what I was looking for. Rated 5 out of 5 by 1beauty from After sitting in the garage in the box for eight weeks the sink has finally installed. Sink is ju... After sitting in the garage in the box for eight weeks the sink has finally installed. Sink is just what I wanted. Beautiful and functional. Had some issues when adding the new counter and fixtures, just didn't measure up to " standard or universal " . Of course maybe the "standard or universal " was in the fixtures and counter. Or could be ? . The installers worked around the problems and it is my dream. If you like a single enamel sink it couldn't be more perfect. Would highly recommend. Rated 5 out of 5 by Pro14Q from Great quality! Great quality! Rated 5 out of 5 by Cookie from Exactly what I was looking for. Works perfectly with my new kitchen. Exactly what I was looking for. Works perfectly with my new kitchen. Rated 5 out of 5 by KimK from Great Quality Sink This is a great looking sink. Very heavy, good quality sink with a nice finish. Rated 5 out of 5 by 316 from Great value, deep This went in a small-medium size kitchen. It's a clean, classic look, and doesn't over power like a big ol farm sink. Plent of working room for its dimmention.